As a strategy, preventive maintenance (PM) has been built on the idea that performing regular work on equipment will keep it safe from breakdowns. And while breakdowns are often caused by a number of factors that can be curbed with preventive maintenance, that’s not all there is to the story. This article from LNS Research recounts a situation where a ski lift at Sugarloaf Ski Resort in Maine failed just one day after undergoing a routine PM, resulting in seven injured riders. The incident brings to light a phenomenon that’s not as uncommon as we would like to think: Equipment failing after a PM that was previously running just fine. How is this possible? As GP Allied reports in a whitepaper titled, “Are You Doing Too Much PM?”, many PMs involve invasive procedures that can be highly disruptive to previously stable systems. If a piece of equipment is taken apart and put back together again every time a PM occurs, you’re taking on the risk of introducing a defective part. And if the job is rushed, you may not know that part was defective until it’s too late. GP Allied describes the phenomenon of “PM creep”: A PM program slowly becoming much bigger than it needs to be. Keeping the previous point in mind, it’s easy to see how this could happen. To the untrained eye, a failure after maintenance is performed could mean that even more frequent maintenance should be performed on that piece of equipment. Before you know it, you may have more PMs than you can handle, being carried out unnecessarily. Of course, this is the opposite goal of introducing a PM strategy. If equipment is taken offline more frequently, you’re increasing downtime rather than curbing it. This refers to anything that causes the maintenance activity not to be carried out properly, for example a gasket not sealing properly. Again, this comes back to the issue of many PMs being invasive procedures that introduce risk. Are you sensing a theme here? If not, we’ll say it again: PMs can involve extremely disruptive, risky procedures. It’s entirely likely that a technician performing a PM could damage one part of a piece of equipment while they’re carrying out maintenance on another piece. Circling back to the idea of PM creep, it’s possible that so much work is being carried out on a piece of equipment that the maintenance team has no idea which conditions cause that piece of equipment to perform best. It’s important to be able to build use cases for optimal performance, and if continuous service is being carried out on an asset, it’s impossible to gather that data. Quite simply, this refers to the wrong activity being performed on an asset, or the right activity being performed incorrectly. If technicians are pressed for time or lack the resources necessary to carry out a documented procedure properly, the potential for human error can be high. It’s an easy question to ask, but a harder one to answer. 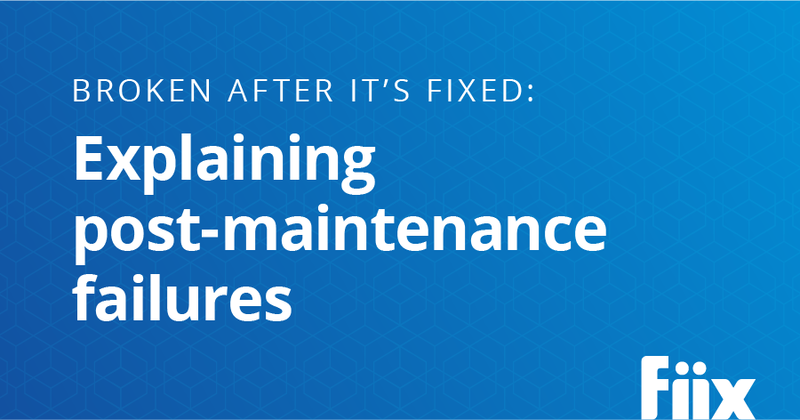 How does an organization begin to figure out which maintenance activities are helping, and which are hurting? The answer lies in PM optimization, which we’ll explore in depth in a blog post next week. What’s the cure for unplanned maintenance?